We interrupt the usual blogging to bring you this special offer. For a limited period only, get a FREE baby* with every purchase of a pram! Hurry, while stock lasts! *Milk & Diapers not included. Other terms & conditions apply. Call 1800-FREE-BABY for more information. This is a cute picture. We are looking for a pram/stroller/jogger. What do you reccomend? Ours is a Maclaren pram. It's average weight, but it's sturdy, the wheels are easy to move around. If weight is an issue, you can try Combi strollers. We are thinking of buying a stroller for Ash soon, when he learns to sit up on his own. Most prob we'll get the Maclaren Volo. hmmm..what's a pram and what's a stroller? I know joggers have bigger wheels. Any other difference? Confused. 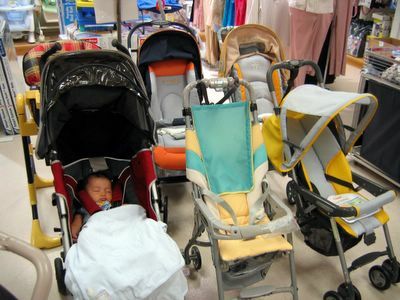 Thanks for your post on my blog about strollers. Have finally gotten one! yay!